﻿ Magazine content за Февраль 2019 г. Case Comment on the Judgment of RF SC No. 32-КГ18-15, 14 August 2018 The comment to the decision of the Supreme Court considers the issue of the procedure for exercising reciprocal obligations in their liquidation stage, in other words, the obligations to return obtained property if contractual relations are disrupted. The aspiration of the parties to an agreement that has fallen apart to provide reciprocity of return pushes modern jurisdictions to various solutions: requiring simultaneous return by both parties, binding the party demanding the return in its favor to be the first to offer the return, fining the party that is last to return the assets for failure to abide by the court order, etc. The Supreme Court is taking an important step towards clarity on this issue in Russian law. Unlike the position found in previous explanations (for example, in Paragraph 7, Clause 1 of the informational letter of the Supreme Arbitration Court of the Russian Federation No. 126 dated November 13, 2008), it draws attention to the fact that return reciprocity cannot be achieved at the expense of autonomy of will: if only one party requests a return, the court cannot oblige it to return the actually obtained property in favor of the other without the corresponding request of the latter. This position makes it possible to refuse some means of ensuring a reciprocal return and concentrate on improving others. Judgment of the German Supreme Court of 12 July 2018 III ZR 183/17 with a Comment The Federal Court of Justice of Germany in its decision dated July 18, 2018, decided that, in case of a user’s death, the social media account, as well as all other property, is inherited. The detailed, logically constructed, and comprehensive argument of the court forms a new legal opinion on the inheritance of digital property. The personal nature of obligations exercised by the operator of social media, the invasion into the private life of partners in communication if access to the account is inherited, and the importance of the account data for user individualization have been assessed. Granting the creditor with ownership of the asset serving as property security is widely applied in commerce as an optimal alternative to a pledge. Such an ownership right is often referred to as «security ownership». In this publication, the content of security ownership as a right in rem is described with the concept of leasing as an example. The components of the ownership right (the elements of the «bundle of rights») are divided between the owner (creditor) and the user (debtor). This division is based on the fact that the latter needs the entitlement in order to possess and use the asset to generate benefits and profits (while the owner retains some elements of the property’s control) and also needs the entitlement (erga omnes) to receive ownership after the performance of contractual obligations agreed by the parties. At the same time, the creditor’s title, without being ancillary, is encumbered with the debtor’s multicomponent limited right in rem. The situation of «dual» possession exists, where the debtor is the direct possessor of the asset and the owner (creditor) is the indirect possessor. This situation requires informing third parties by entering information into the relevant public register. Granting the creditor with ownership of the property provides him the chance to rely on the feature of elasticity. This means that after cancellation of the corresponding contract, the debtor’s rights to property will terminate and the creditor’s ownership will be fully restored. The author of the article focuses on so-called «purely economic losses». These are losses that arise from the behavior of another person, but not as a result of causing physical harm to the victim’s health or to things. It is argued and substantiated that human activities are fundamentally harmful. However, it does not follow from this that any conduct that causes damage deserves censure. The author raises the question of the limits of tort liability and focuses on the situation when losses are not evidence of a violation of a right (absolute or relative), but a sign of impairment of a certain interest that is not always expressed in the form of a subjective right. A comparative review of French, German, and English law showed a significant difference in the approaches to acceptable indicators for recovering purely economic losses. The author demonstrates that despite the wording of Art. 1064 of the Civil Code of the Russian Federation, the possibility of recovering purely economic losses is questionable due to the critical problems of the generally accepted understanding and application of such elements of tort liability as harm, property, wrongfulness, and guilt. The article states that the understanding of the principle of general tort in Russian law does not coincide with the reference understanding of this principle in French legal order. The domestic understanding of this principle is not very compatible with the possibility of recovering purely economic losses. Finally, the author of the article proposes shifting the focus in deciding the issue of compensation for losses from a violation of the subjective right to an interest protected by law, and also puts forward a number of political and legal criteria that must be considered when justifying the recovery of these losses. The possibility of revising judicial acts that have entered into legal force and that differ from the positions of the Constitutional Court is subject to the criterion developed in the practice of the Constitutional Court, according to which judicial acts may be reviewed for new circumstances at the request of persons who did not participate in the constitutional proceedings only if these judicial acts are not executed or are partially executed. However, the content of this criterion has not yet been clarified. What does execution mean in relation to a judicial act that does not require execution? The article argues that the criterion of execution in this case should be interpreted independently: a judicial act should be considered as non-executed (partially executed) only when, despite its entry into force, its legal effect has not been fully realized (the purpose constituting the content of the claim was not achieved). Only one case falls under the criterion of the execution of judicial acts: when a judicial act that has entered into force, based on the provision of the law, is subsequently recognized by the Constitutional Court as unconstitutional directly or indirectly, the person is obliged to give, do, or provide something, and this person who did not participate in the constitutional proceedings did not fulfill this obligation. The article considers the problems arising in court practice regarding the lawfulness of a setoff of a penalty and principal debt. After 2012 court practice allows one to terminate a penalty and principal debt by setoff. However, some courts do not observe this approach and demand the incontestability of a penalty as a necessary prerequisite for a setoff. 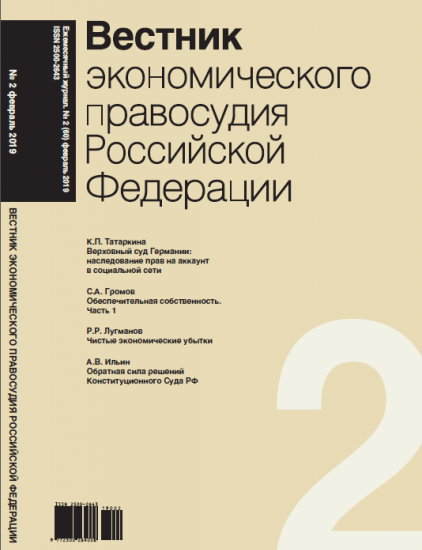 Analysis of court practice leads the author to the conclusion that the permissibility of termination of a penalty and principal debt by a setoff calls for reaffirmation by the Supreme Court of the Russian Federation. The author analyzes the possibility of challenging the grounds for charging a penalty or its amount and discusses the consequences of penalty reduction by the court. Judicial practice does not provide an unequivocal solution to the problem, in particular due to the uncertainty of the position of the Supreme Court of the Russian Federation. The article describes two approaches elaborated by the courts. The first one relies on quashing the setoff and the second one involves the recovery of unjust enrichment. The author emphasizes that the choice between these approaches affects the possibility of recovering contractual penalties and the continuation of security of a principal debt. Analysis of court practice demonstrates the diversity of reasoning while tackling this problem and the need to choose between two represented approaches for universalization of practice.